This is a good idea for naturalists, here are two instructional video how to DIY pebble backsplash to create a wonderful natural kitchen. To attain a natural and fresh look of your kitchen you ought to use a natural and earthy materials such as pebbles. 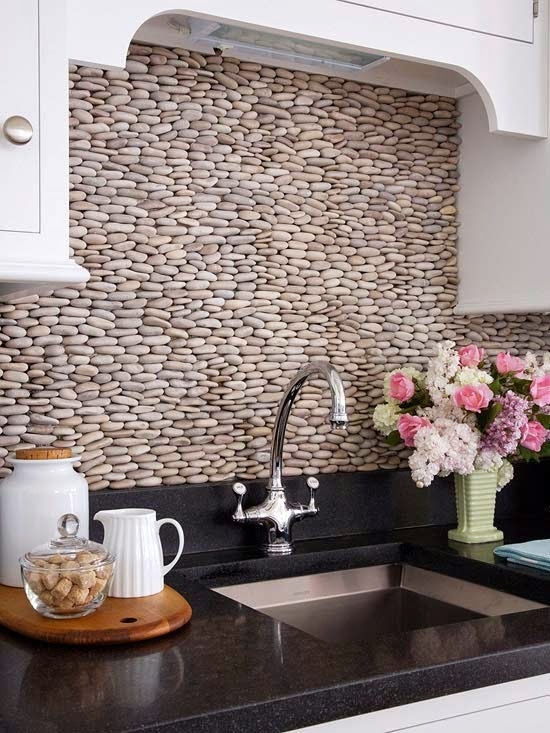 If you want to remodel your kitchen and you lack an idea of what you should do with the backsplash here is a hot one : Pebbles Backsplash. The Pebbles Backsplash project is pretty easy to do and will certainly help you to create an outstanding and architecturaly advanced appearance of the kitchen. Pebbles with their distinctive structure will help you t0 create an interesting visual effect in the kitchen and provide the place with fresh and vibrant note. Take a look at the video guide below. So we have finished writing the post [DIY] Pebble Backsplash For Natural Look of the Kitchen and wish to offer you the interior designs so that you can share with friends and relatives on Facebook Twitter and Google Plus and other social networks and digital networks, also you can send comments through the box below to express your opinion on the article, so you could send suggestions and preferences to take into consideration for editing and adding, a bouquet of love appreciation and respect sent to you through Interior4Design platform.